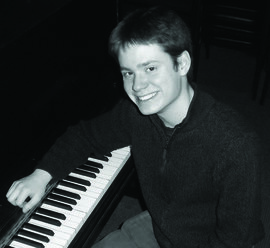 Jazz studies major and pianist Josh Condon '14 got to perform on one of the country's greatest stages last January when he performed on Millennium Stage at the Kennedy Center with the 2012 Mid-Atlantic Collegiate Jazz Orchestra. "It was an honor and privilege to perform in such an amazingly beautiful venue in such a historic part of the country," says Condon. "It was very humbling to perform with other extraordinary talented students from colleges along the East Coast." Mike Titlebaum, head of the jazz studies department in the School of Music, nominated Condon. Titlebaum says the conference is a chance to showcase some of IC's best and brightest. "It's an opportunity for students to meet and perform on a prominent stage as a unit," Titlebaum says.